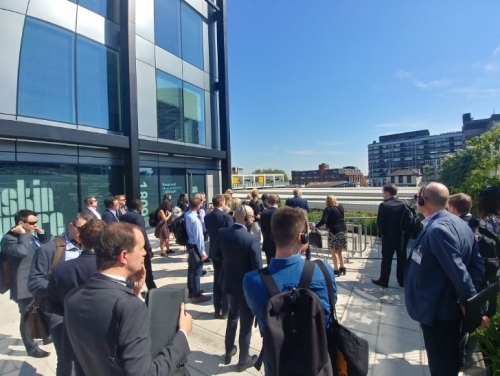 The spring Croydon Investor Tour was hailed a huge success as around 50 business leaders were given an in-depth look at the town’s dramatic transformation. The 12th installment of this bi-annual event, organised and led by social enterprise Develop Croydon, took the group on road, tram and foot around a route of the town’s latest developments and some of its cultural gems. Develop Croydon have been hosting the tours for the past six years, but the level of interest remains as strong as ever – with the event once again fully subscribed. Guests were left hugely impressed with the dramatic pace of change around Croydon and all came away feeling they had learned something new and worthwhile about the town’s regeneration and historic past. The day began with breakfast at Boxpark, followed by opening speeches from SHW Partner, and chairman of Develop Croydon, Richard Plant, Vanessa Clark, Principal of Sinclair Clark, and Opama Khan, Inward Investment Manager at London Borough of Croydon. A coach collected the party on Dingwall Road, taking them past many of the new buildings and sites helping to provide around 32,000 new homes and 27,000 new jobs as part of Croydon’s £5billion regeneration scheme, before heading out on London Road. From there, the guests travelled along the Purley Way where SHW partner Alex Gale explained that Croydon is now the location of choice for many major companies distributing across south London and further afield – with twice as much industrial and logistics property across the borough as there are offices. After taking in the Colonnades and the famous Airport House, the coach returned to the town centre. Under glorious blue skies, the group set off on foot to take a closer look at HMRC’s new offices at Ruskin Square. Transport for London generously offered a private tram ride looping around the centre of town, past Surrey Street Market and Reeves Corner. A coffee break and talk were then laid on by Sussex Innovation at the iconic One Croydon building, before the morning culminated in a walk back past Fairfield and through the high street. Guests were shown some of the fantastic pieces of street-art now adorning the buildings and were treated to a special look inside the stunning 400-year-old Whitgift Almshouses. Dominic Glanz, from Westfield, wrapped up the morning – taking the group through the Whitgift Shopping Centre and giving guests the latest updates on the Croydon Partnership’s £1.4billion retail development, with construction due to begin next year. Attendees were able to discuss the morning’s findings over lunch at Amp House. "These tours always prove extremely popular and it was no different this time,” reflected Richard Plant, Develop Croydon Chairman. “The sun shone on us and we were able to show again just what a fantastic place this is to work, live and enjoy. Many thanks to Develop Croydon for permission to syndicate this piece.